You arrive home late. Work was horrendous and so you are a coil primed to spring. The Frenchman is on the couch, waiting to say hello, but right away you would like to know why he has not prepared dinner. Nevermind that you did not technically ask him to make dinner (isn’t he just supposed to know?) and that he has likely had a long day himself (but you left before him and came home after him that day, so you win). He expresses his sympathy over your difficult day, and sits you right down to massage your weary shoulders. But the whole day, when you think about it in hindsight, has primed you for anger. All you needed was this tiny little spark to set you off, and so here you are, sitting at the kitchen table with anger building to a boil. Off you go. You say things. You are at least 39%, but up to 68% right. You hate to feel resentful about cooking for the Frenchman, because you actually love it very much, but in this moment you are just so mad about it all, about everything. Later, you insist upon eating your toaster oven-Amy’s-pizza dinner by yourself. You are not a perfect person, and sometimes it is necessary to act like a child. The next morning, things still aren’t right. The Frenchman leaves for work, and you have the day to yourself. After all the office scurry, the quiet feels more pronounced. It is an indecisive fall day, and you wish it would just rain already. You could use the vicarious release. 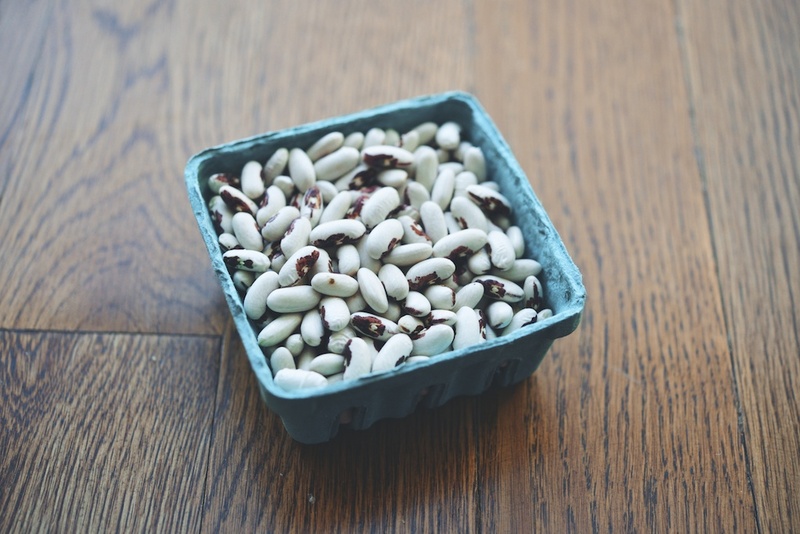 The previous Saturday, you bought a punnet of European Solider Beans from the market, and they have been quietly taunting you from their perch on the shelf ever since. What to do with these beans? They have become a medusa of possibilities in your mind. 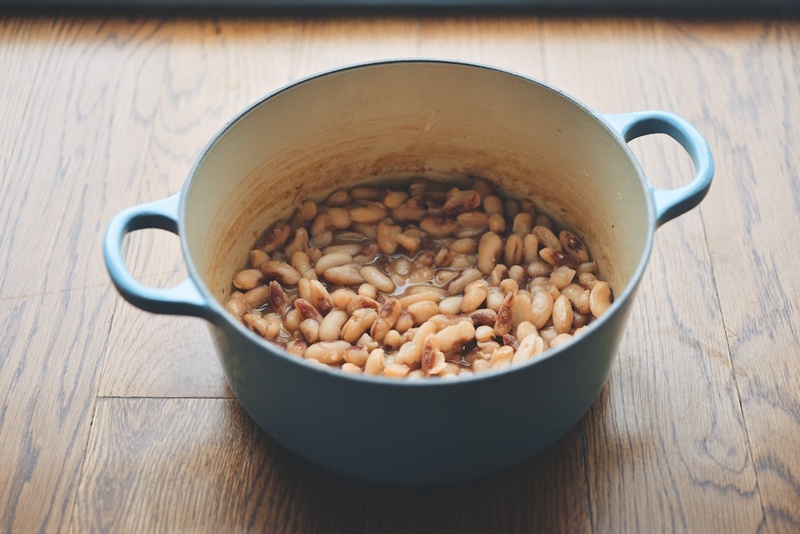 The Frenchman adores white beans, so you don’t want to “waste them” on a crummy preparation. All week you scribble notes, throw them out, and scratch out some more. On this uneasy morning, you are still nowhere. You pace the apartment. You lift a massive sweet potato from above the refrigerator. Thoughts about how phenomenally lovely the Frenchman is almost all of the time creep in, but you still want to be a little mad, so you push those thoughts away and cup the sweet potato in the palm of your hand. Sometimes things are not perfectly linear. Sometimes we must simply allow ourselves to feel what we are feeling. It is soothing, the violent “click, click, click” the peeler makes every time it hits a patch of rough potato skin. Scraps of peel slowly pile in the pail, like flower petals, like the rust colored leaves outside the window. Peeling the sweet potato does not offer bean-clarity. You bike to the market. It is so good to spend a little time among vegetables. The multi-colored carrots are fat, forked imperfectly at the bottoms and whiskery. The fennel, modestly bulbed all summer, is now larger than a softball and literally splitting open at the base. The celery smells aggressively herbal–half fanning leaves, half thin stalks. There are an embarrassment of apples, piles of dark and leafy greens, pears, funny heads of cauliflower, green beans, and brussels sprouts. 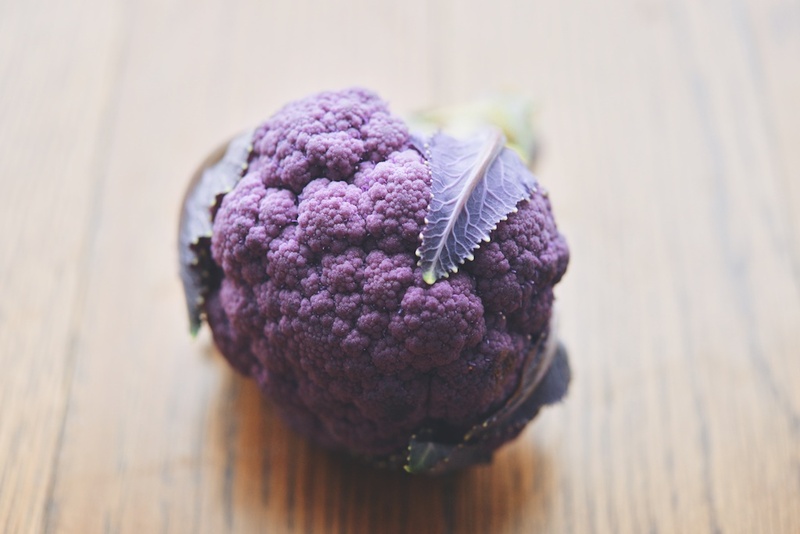 At the checkout, the attendant smiles at you and, for no reason at all, plucks a tiny purple head of cauliflower from the pile and adds it to your bag. You feel a little bit better. At home, the urge to cook returns, as inevitable as gravity. You set the beans to simmer and the vegetables to roast, and you write to that sound for some time. The meal comes together. You decide that, while this may not be the most sophisticated, original, or perfect recipe you have ever composed, that is ok. This recipe serves a purpose. It speaks of fall, and of comfort. You will eat one portion for lunch, and the rest can be repurposed over the next couple of days, easing the stress of figuring out what to cook from scratch. And the beans are magnificent, soft and deeply flavored. You save them for the Frenchman. He will eat them for dinner, served warm with all those cloves of roasted garlic and a heel of bread, maybe some cheese or a browned sausage. When you love someone, “winning” a fight is not the act of conquering, but instead that of concession and compromise. It is the the return to the happy norm. Sometimes, dinner is the salve that heals all wounds. A few notes: I used European Soldier Beans from the market, but nearly any dried white bean will do. Also, I happened to have a bunch of mushroom stems in the refrigerator from another cooking project, so I used those. Please feel free to change up your vegetables based on your preferences–swap squash for sweet potato, fennel for onion, broccoli for cauliflower, or the dark leafy green of your choice for spinach. 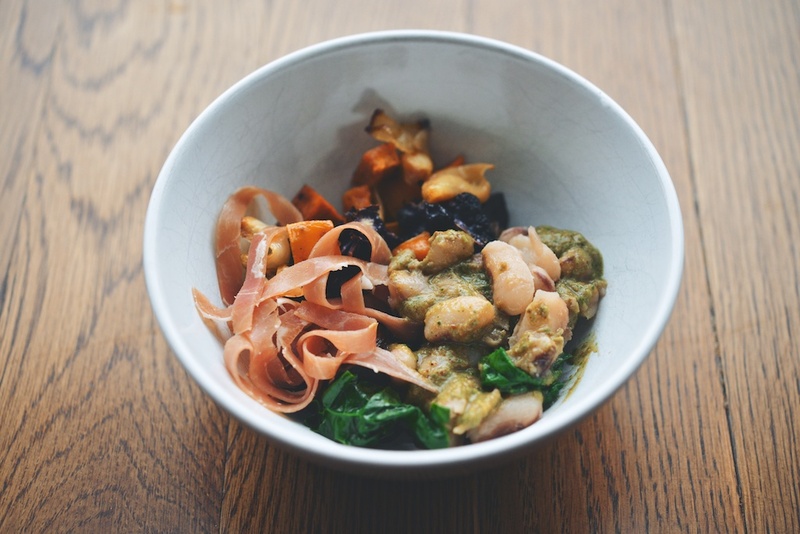 The beans, vegetables, and pesto can all be made ahead of time. Serve any extra pesto over: pearl couscous, farro, wheat berries, pizza, eggs, pasta, grilled cheese sandwiches, tomato soup, or simply scraped over toast with a pile of the white beans. 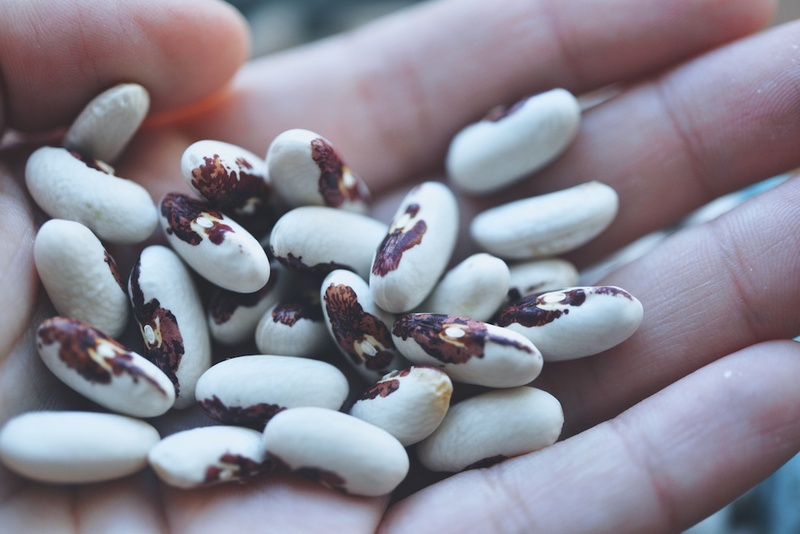 8-12 hours before you plan to cook the beans, pick them over; remove any small debris. Move the beans to a large bowl of cool water to soak. After they have soaked (usually overnight, or all day while I’m at work), rinse the beans, and move them to a medium-sized saucepan. Cover the beans with about 3-inches of fresh water. Bring the water to a little boil, and then lower to a simmer. Cook the beans for 1-3 hours, until they are soft, but not falling apart. (The time will depend on a number of factors, including the age of the beans. Do not despair. Slow and steady wins the bean race.) Add salt, to taste. Turn the oven to 350F. Bake the walnuts for 10 minutes, until they are browned and smell divine. Set the walnuts aside to cool. Increase the oven heat to 375F. As you chop them, add all the vegetables to a large mixing bowl: Wash, dry, and halve the mushrooms. Peel and roughly chop the onion. Cut the cauliflower into florets. Peel and small dice the sweet potato. Finally, add the garlic cloves (unpeeled) to the bowl and then add 1 tablespoon of kosher salt, several cracks of black pepper, and 3 tablespoons of the olive oil. Toss, to evenly coat the vegetables with the oil, salt, and pepper. Move the vegetables onto a baking sheet, and the baking sheet into the oven. Cook for 35-40 minutes, stirring occasionally, until all the vegetables are shrunken and browned in spots. Turn off the heat, but keep the baking tray inside the oven, so that the vegetables stay warm. Meanwhile, wash and de-stem the spinach (if you are using baby spinach, obviously you can skip this step). 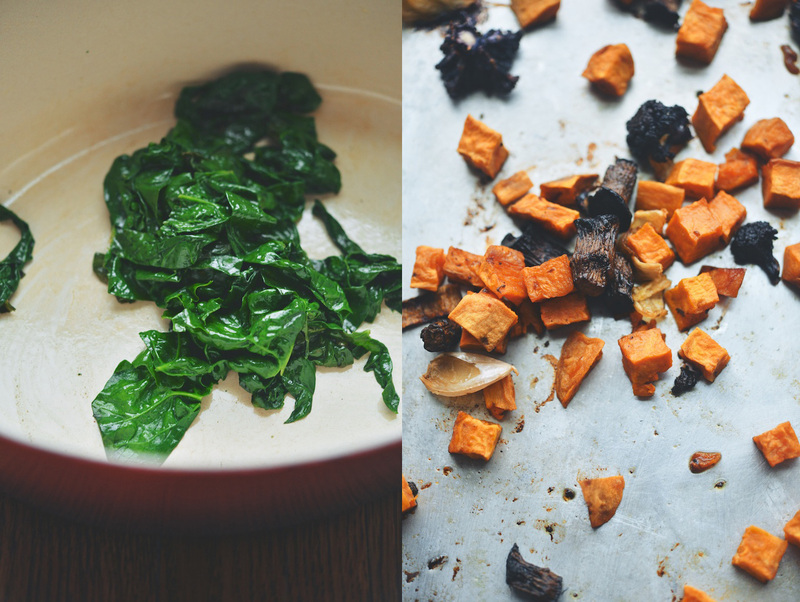 Set the spinach aside. Remove any wide strips of fat from the prosciutto slices, and then cut the slices lengthwise into ribbons. Set those aside as well. Move the toasted walnuts to the bowl of a food processor; pulse them about 15 times, until the walnuts are crumbly. To the bowl, add the basil, the Parmesan, the lemon juice, the lemon zest, 1/4 teaspoon kosher salt, a couple cracks black pepper, and one of the roasted garlic cloves (peeled) from your roasted vegetable tray. Blend, while adding 1/4 cup olive oil in a slow, steady drizzle. 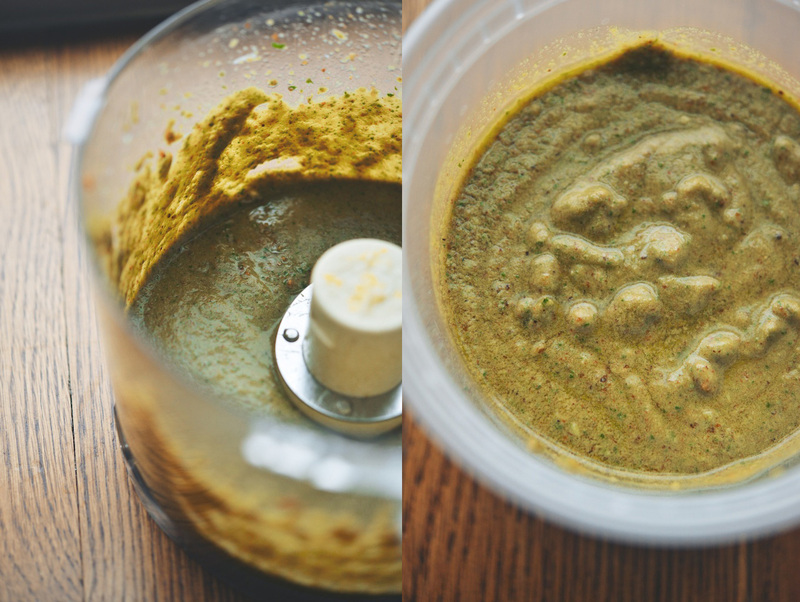 (I like to mix the pesto until it is quite unified and saucy.) After mixing, taste the pesto; adjust the salt and lemon juice as you see fit. Saute the spinach: In a large saucepan, heat the remaining 1 tablespoon of olive oil over medium heat. Add the spinach, and toss to coat it in the oil. Cover the saucepan, and let the spinach steam for about 3 minutes. Remove the lid and finish cooking. You want the spinach to be wilted, but still bright. Stir in the vinegar, and finish with a small pinch of kosher salt. 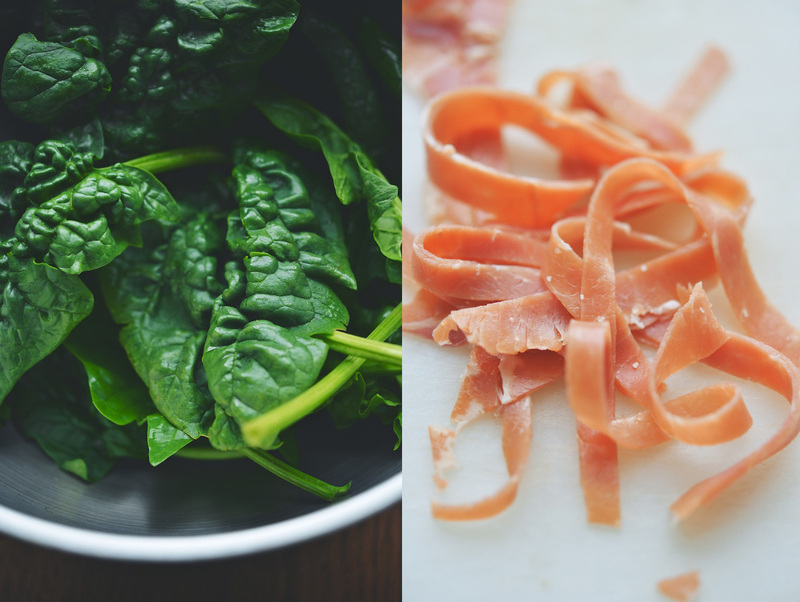 Divide the spinach among four bowls, and then do the same with the prosciutto ribbons. Pile a tumble of vegetables on top of that, and then a dollop of the beans. 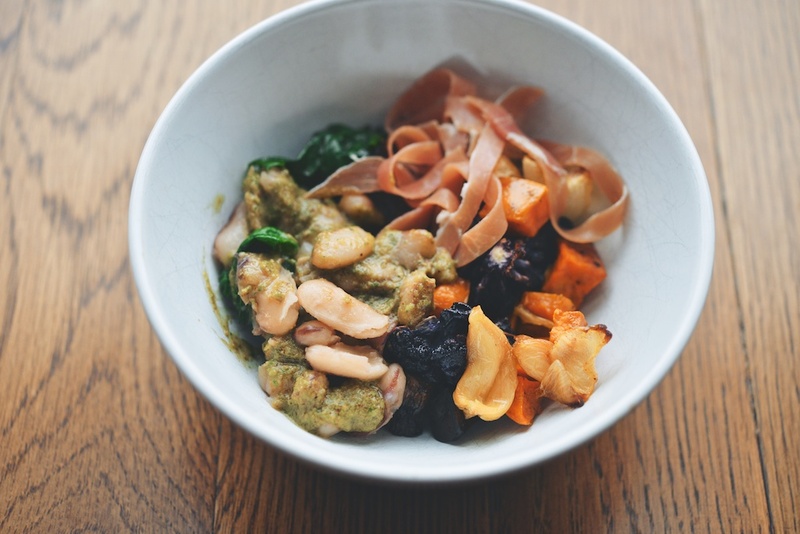 Finish with a spoonful of walnut pesto. Use your fork to move the layers around, getting a little pesto, and maybe a prosciutto ribbon, into each bite. 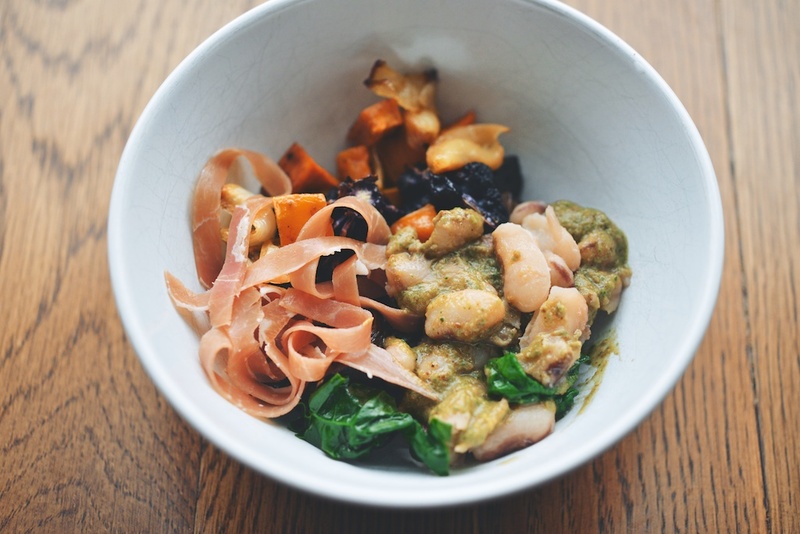 It might not be the prettiest bowl of food, but it makes for a fortifying fall lunch. How many times has being hungry gotten me into trouble! ?